Edging is a vital part of any lawn. It is almost necessary to edge your lawn to preserve your garden bedding, patio, walkway & driveway etc. without proper edging the sand with start to spread around and your pavers will start separating. You are also securing your patio, walkway & driveway through rain and show. Edging enhances the quality and look of your landscaping plus helps main the lawn much better. Edging can be useful in many ways. It not only increases the value of your lawn but also improves the appearance. Any kind of edging you choose, there is enough variety to match your requirement. It is also cost effective in the long run. The right lawn edging will significantly reduce your lawn maintenance in terms of mowing and weeding. It also serves as a great border to define your lawn and also create barrier with your lawn and landscaping. Edging could be the first thing noticed when entering the house, thus, it is very important to choose the right material that will determine your taste and style suiting the interior of the house. Lawn edging should complement the surroundings and rest of your house. There are two types of edgings, natural and simulated. Natural edging consists of rocks, mulch, wood and organic planting etc. simulated include materials like plastic, metal & brick etc. These materials can be textured or smooth, colors can be subtle or bright. It can be of metal, wood, concrete or plastic etc. You should choose the one that would blend well with the surroundings. Once you have decided to go for lawn edging after a through research, next question will be what kind of material to go for. There are so many different materials available in the market. It can be little overwhelming at times. Here is some information on the types of edging to make your decision slightly easier. Brick and concrete lawn edging gives a formal look to the place. They are very durable and can work in all kinds of settings. This is more permanent edging and can look discrete if need be. Brick works better in curved areas whereas concrete is more ideal for straight and flat lawns. Only thing you should keep in mind is, they should be put low enough to prevent from damaging the lawn mowers. Also it is important to use the bricks, which is more suitable to the local weather. The edging comes in wide variety and designs and some interesting patterns can be created out of them. They are ideal for edging the walkways and paths. You can also find ready pavers. Some of them have a brick like look but they are made of concrete. Brick lawn edging is easier and also economical and it works with most of the lawns, pavements and gardens. Go for earthy colors as they enhance the greenery around and give it a very attractive, classic look. Pre – cast concrete pavers can also be used for the edging. It will compliment your existing area and they are easy to work with. They come in various colors and can be bought in customized sizes suiting your need. They are very durable and also a good choice for outdoors. Any kind of lawn edging you choose, keep it mind it should complement your lawn and surroundings and not take anything away from it. Metal lawn edging is made of steel or aluminum. It is a flexible material perfect for curves, angles, corners, or straight lines but it can also be made into hard material sturdy enough to give edging to straight lines. It is a very functional edging and poses no problem for mowers or any other maintenance equipment. It is very easy to maintain. This edging doesn’t look as natural as brick or concrete but it gives a fancy look to the garden or lawn. It last for a long time but it may rust over the time. Though some people welcome this rustic look and it may look endearing in certain settings. Metal lawn edging is sold in 10 feet length and 4” height. 12 or 14 gauge is good for residential users. 1/8” edging is recommended only for commercial place. You can also get decorative metal edging. They come in a variety of different patterns, colors and designs. It can be used as an accessory for your flower pots and garden statues or landscaping. Please make sure before if you want metal edging as it is more tedious to change it than to install it. So give it a good thought before making your decision. Edging is like a frame to your landscape and lawn and defines lines between beds and lawn area highlighting its focal points. It also provides your lawn with certain character giving it a proper shape and structure. Steel lawn edging was the first type of edging used for lawns and landscapes. It is stiff strong, and durable. If you need to separate hard elements such as driveways or concrete patios from soft elements such as lawns steel edging is ideal. Only galvanized steel should be used as it is susceptible to rust. That is important in the long run specially after rains. Steel edging is available in galvanized steel finish and in green, black, or brown colors. Aluminum lawn edging is an alternative to steel. It is cheaper and easier to work with. Due to its flexibility it is more adaptive to the free form designs in different kind of planting beds. It is most often used between lawns, planting beds, and shrub borders. Aluminum edging doesn’t rust, making it ideal for ocean front properties that are exposed to salt. It is available in several colors, including natural, silver and black. Bamboo lawn edging is a self standing big pole round in shape. It gives a wonderful look to your garden or lawn. These are made of 1.5″ to 2 1/2″ diameter in different lengths. Bigger poles make the edging more effective in holding the beds and standing firm. Bamboo can also be flexible and can be bent to different shapes during installation. It is very easy to install and come in rolled form. It can also be curved to put in such areas. The height of bamboo varies from 8 to 12 inches and length comes in 6ft. it comes in natural finish and black. The top of the poles are cut a bit so that water would not accumulate in the poles. The bamboos are strung together with heavy galvanized wire which go inside and not visible from the outside to give it a even look. Wood lawn edging comes in different styles. It ranges from natural finish to decorative fencings. Landscape timbers are very popular too. They look beautiful and give a very fancy feel to the place but they can be weathered sooner than other edgings. Edging is an essential part to enhance the beauty of your lawn or garden. It also ensures the maintenance of your lawn and garden. Decorative lawn edging plays a major role in improving the appearance of your garden. Your garden can be lush green, your plants may be beautiful but if weeds are peeking out of them, it may lose some of its attraction giving the place very untidy look. Decorative edging can bring out the best in your landscaping making it look more attractive. Edging come in many styles and colors and you can choose the one suiting best to the surroundings. It comes in variety of materials like brick, tiles, concrete, plastic, wood, timber etc. you can also be creative and use mix and match to create your own decorative edging. Any style you choose, it is important that you keep your lawn, garden or landscaping properly edged as this minimizes the risk of weeds. It also enhances your plants showcasing the location of each plant. Brick edging is one of the most popular ways to your lawn or garden. You can use painted bricks edging to decorate your lawn. It provides a beautiful look to the place. Brick edgings come in different colors ranging from gray to green. You can either go in for one color or even mix and match creating an interesting pattern. You will have to dig a shallow trench and half the brick into the trench to create the edging. You can put the bricks in different ways like slant or straight. You may use your own imaginations as long as it forms a neat pattern and serves the purpose. Tile is another wonderful way to create lawn edging. Using tiles can be very creative, with some imagination you can create some amazing designs. Try to look for sales on ceramic tiles on some discount and outlet stores. You can buy mix and match tiles if you want to make your edgings little more decorative. Tiles not only look beautiful they are very neat too and very easy to maintain. You can use different shapes and pieces and make some designs combining them. You can either put them directly on the edgings or glue the tiles to a piece of plywood and then use them for borders. Using tiles on the edge of your walkways can also give a very contemporary look to the place. Wood can also be used for decorative lawn edgings. Wood comes in lot of different colors and varieties. Using any kind of wood compliments your garden’s appearance and gives a soothing rustic look to the place. It also weathers beautifully and doesn’t need much maintenance. Even plants can be used to create edgings. They are like living borders growing like plants. If you use perennials, they can multiply with time and create more borders naturally. You can also use surplus plants as borders around your lawn or garden creating a very natural edging which will grow like any other plant. You can use different kinds of plants with different colors your garden a very distinctive look. Each edging is unique on its own and no matter what edging you choose it is more important to use decorative lawn edgings than not. Edging definitely gives a certain character and charm to the place. It doesn’t only make your garden look beautiful but can also be converted into a real creative work of art. 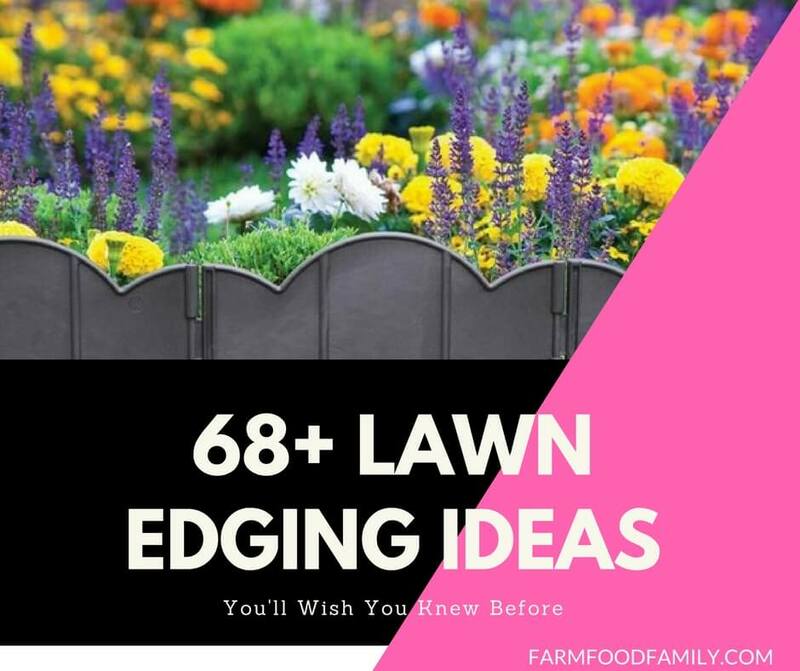 Take a look at these 68 beautiful lawn edging ideas that will transform your garden. The use of concrete edging for flower beds is popular, economical and attractive. The use of concrete edging for flower beds is popular amongst home gardens and landscapes. Not only does it help define different flower regions and separate them from other areas of the garden, but it also gives the flower bed protection from land mowers and weed trimmers. Proper placement of edging results in a well-groomed, attractive landscape. Concrete edging comes in many different designs to suit a broad range of gardening preferences. For the beginner or occasional gardener, concrete edging is also easy to assemble as well as economical. Several different types of concrete edging are available to purchase for the home gardener or landscaper. The most common type of concrete edging used today is concrete blocks, typically in shades of light grey. These blocks are easy to move around and can be used in a variety of ways according to the shape of each individual landscape. Other types include concrete edging in varying shapes of small logs, stones and scallop trees. Curved shapes conveniently allow for easy placement around rounded edges. Typical colors include light grey, charcoal and red. Concrete edging serves to separate the landscape from one type to another. Flower beds are the most common type of landscapes that utilize edging. 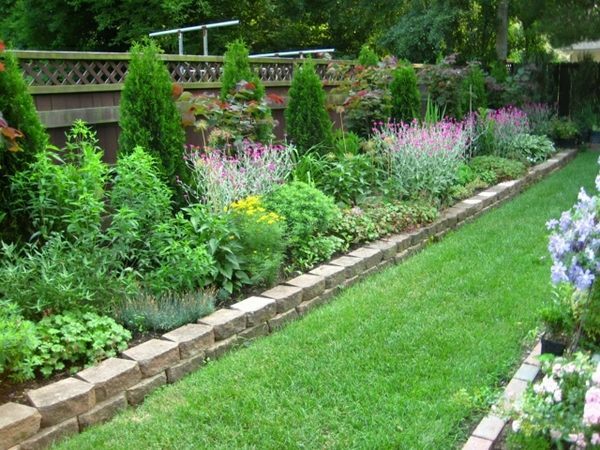 This separation helps define and draw attention to the flower bed while providing a well-groomed appearance. Edging also helps contain mulch and plants that might otherwise spill over onto the lawn. The use of concrete edging provides a distinct feature for landscapes. 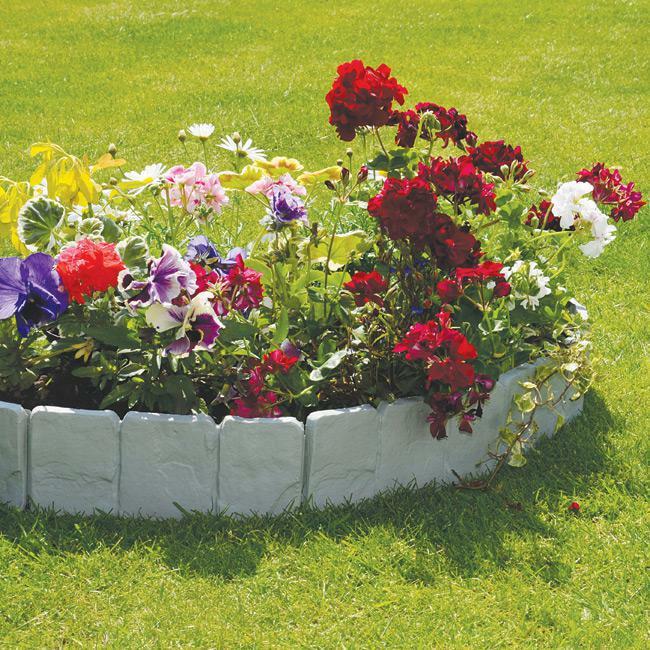 The solid blocks allow for a continuous, complete border for flowers and plants. Since each adjoining piece lines up perfectly with one another, the edging appears to be molded for that particular landscape. Concrete edging can also be utilized as stepping stones if large enough blocks are purchased. This helps form a walkway into the garden without disturbing surrounding plants and flowers. Since concrete edging can be heavy, be sure to have proper transportation available in order to avoid dropping and breaking the pieces. Careful handling is required to avoid breaking. Be sure to dig out the lawn and mulch to provide a place for the edging to lay. Taller concrete edging will require deeper depressions to ensure it does not topple over. The benefit of using concrete edging over other types of edging such as metal or wood is durability. Wood can easily rot if infested with bugs and needs to be routinely replaced to remain attractive since it does not weather the elements as well as concrete. Concrete edging is also much more economical so it is suitable for those home gardeners with a limited or tight gardening and landscaping budget. It weathers well and provides a solid separation from lawn or other parts of the garden. All great edging ideas,but I have bermuda grass. Any tries to stop it from getting thru haven’t worked. Any suggestions? Item 11 – for “Tutorial at Primrose” is a dead link and there is NO tutorial. It only displays a picture of the same thing. Update your links and quite wasting our time. sorry for the inconvenience. I’ve updated the link.